I love fall. I just love it. It’s such a rich season – full of colors and textures and scents. 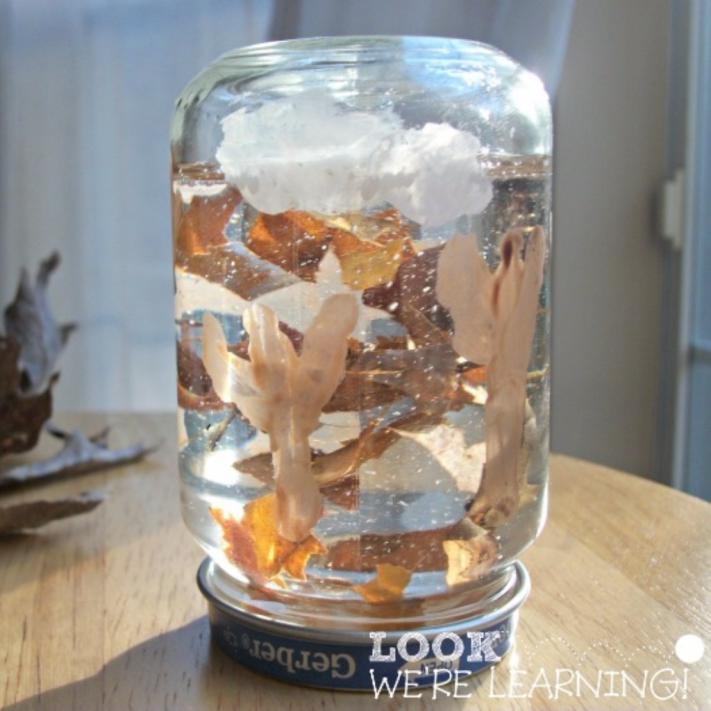 It’s a perfect time of year to go into full-on crafting mode. 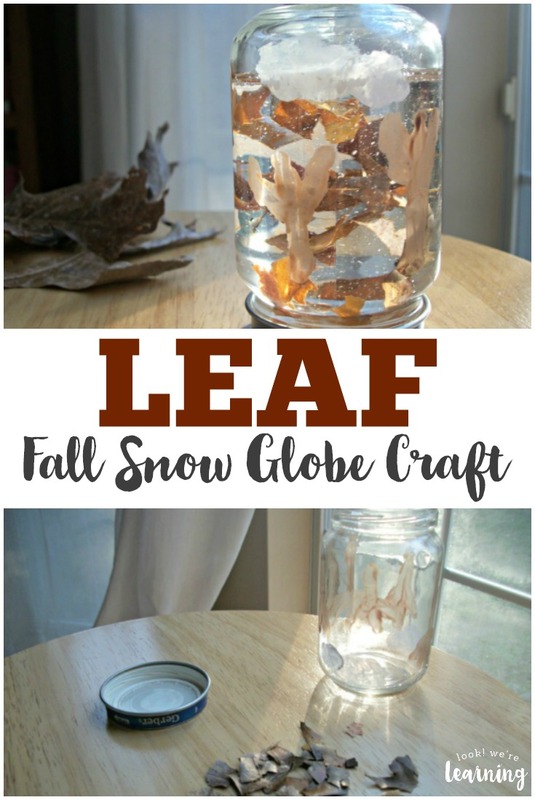 Since we had a lot of leaves left from our Fall Leaf Garland, I thought we could make a fall “snow” globe with them. 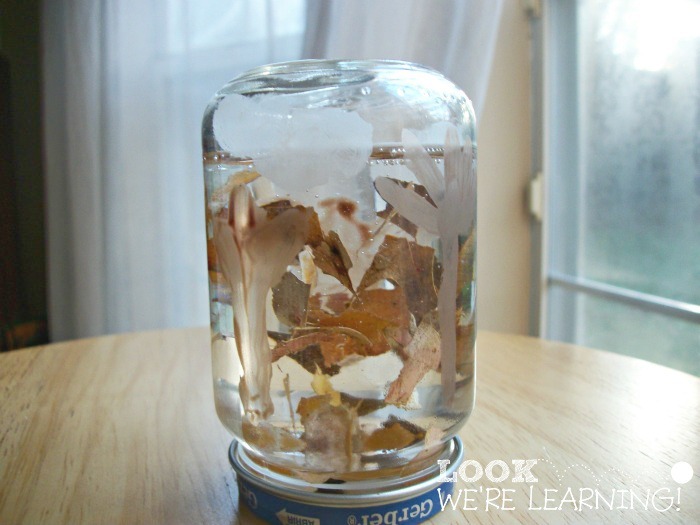 And since I love easy kids’ crafts, it seemed like a quick and fun project to make. 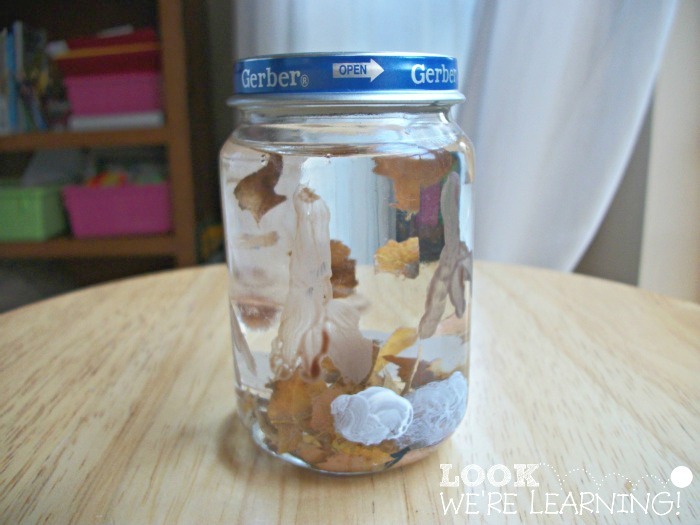 See how you can make this easy fall snow globe craft for kids! 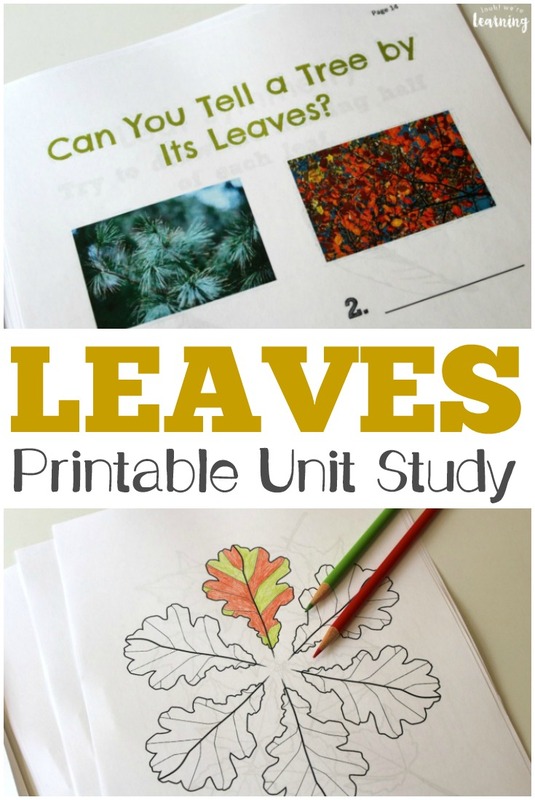 If your kids love making this craft, check out some of our other fall learning ideas, including our Leaf Painting Activity, our Coffee Filter Owl Craft, or our Fall Leaves Unit Study! 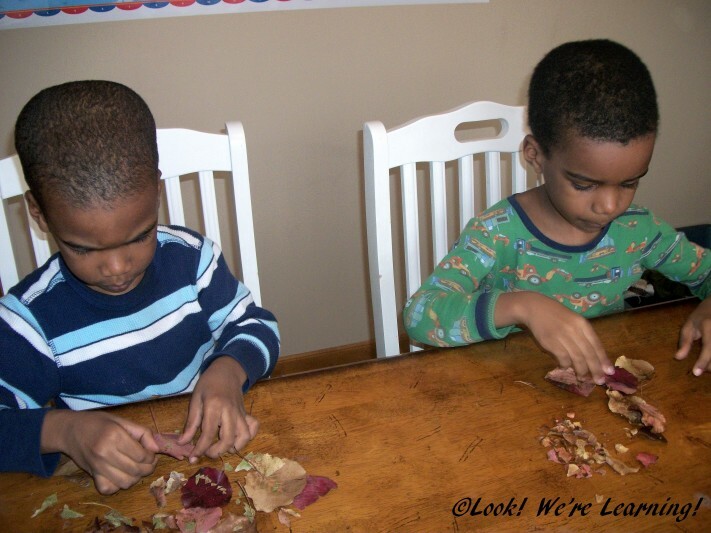 To get started, we just scrunched up a lot of our leaves. If I ever want my kids to have fun instantly, all I have to do is give them the chance to destroy something. Look at that face! That is pure glee. 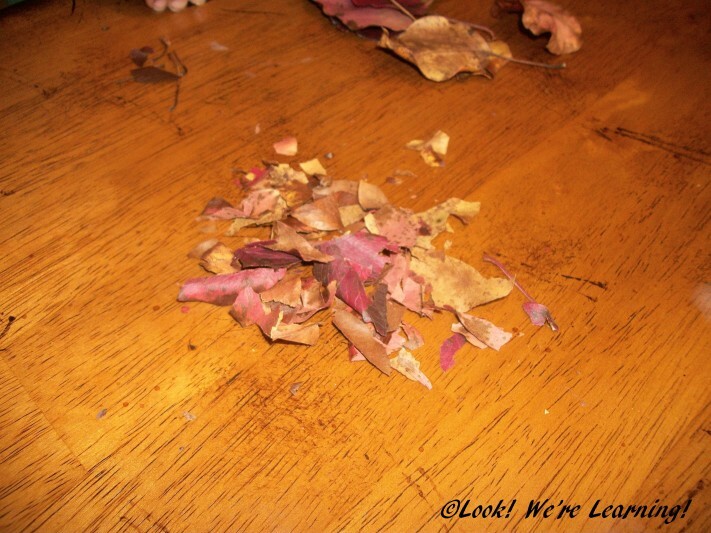 A quick look at our supplies: crushed leaves, brown paint, a baby food jar, and baby oil. Did I mention that this is really, really easy? 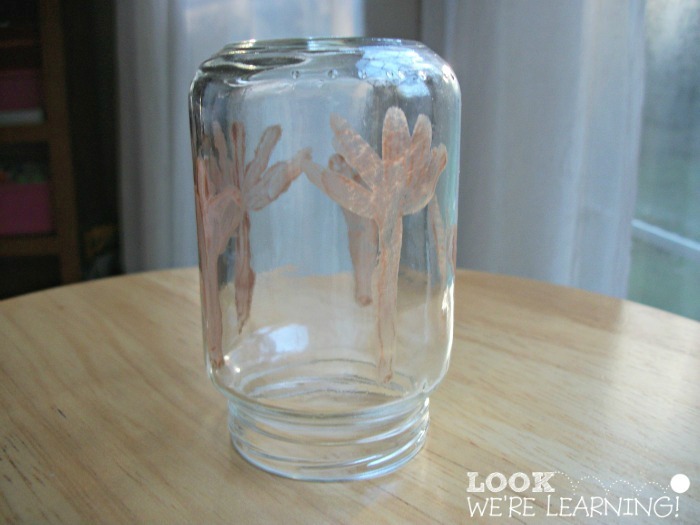 Paint a few barren trees on the outside of the jar. If you want, go back and add a few white clouds. 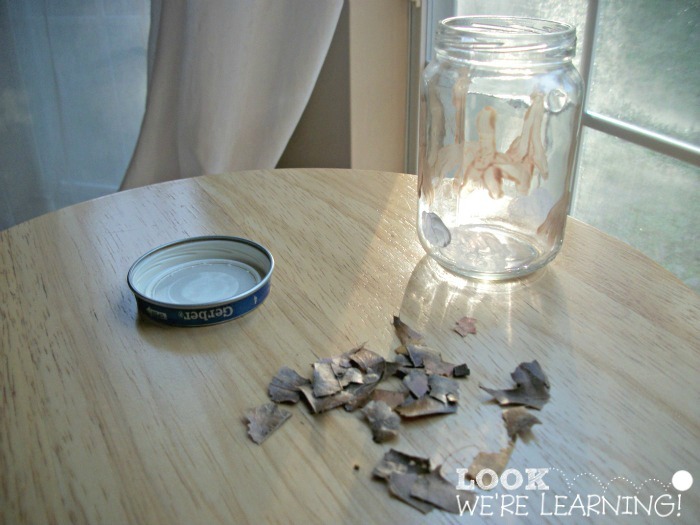 Turn the jar right side up and add the crushed leaf pieces. Pour in the baby oil. Screw the lid on top. If you want to add extra hold, you might hot glue the lid on. 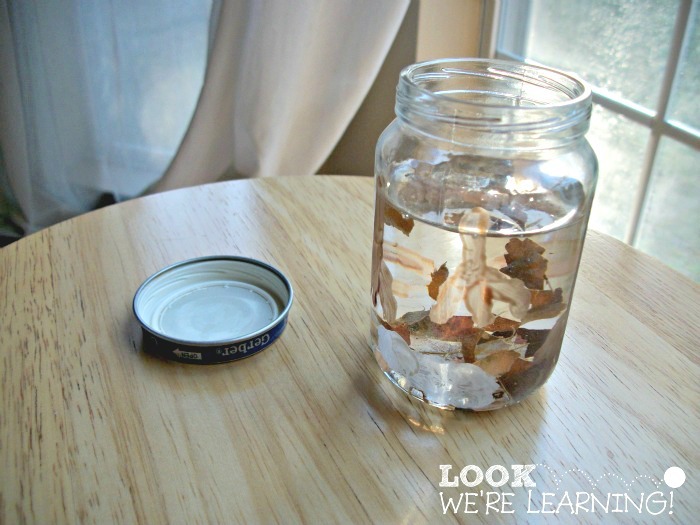 Turn the jar upside down and give it a shake! 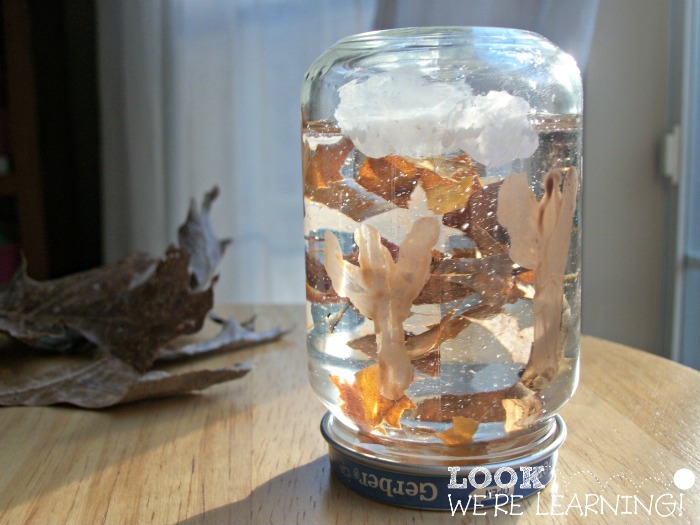 This entire activity takes about 20 minutes from start to finish, so it’s a great craft to put together in a hurry. 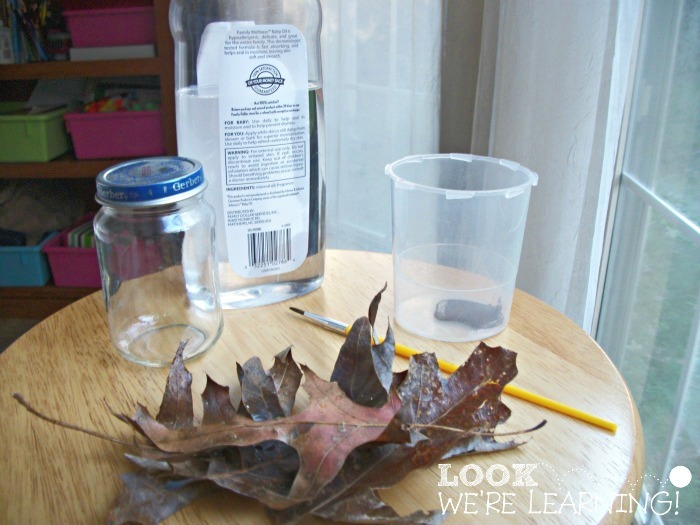 If you want to add a bit more decoration, you could hot glue a scarecrow figurine to the lid so that the scarecrow would be “caught” in the leaves when you shake the jar. You could also add a bit of glitter for extra sparkle! 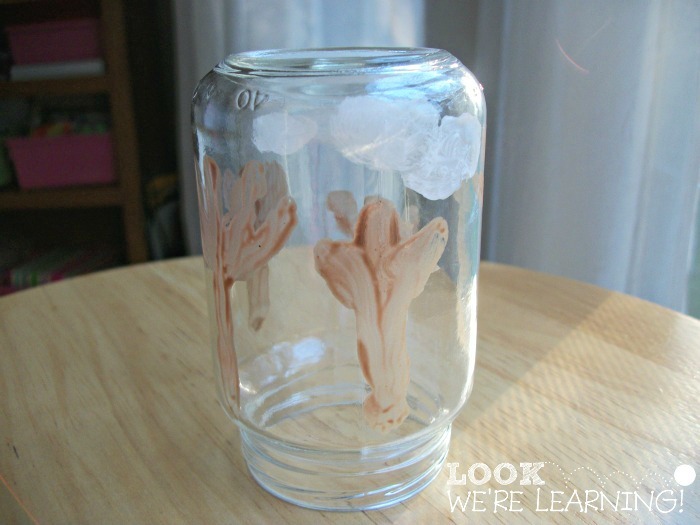 Oh – one quick note: If you paint the jar first, give it time to dry before you go on to the other steps. 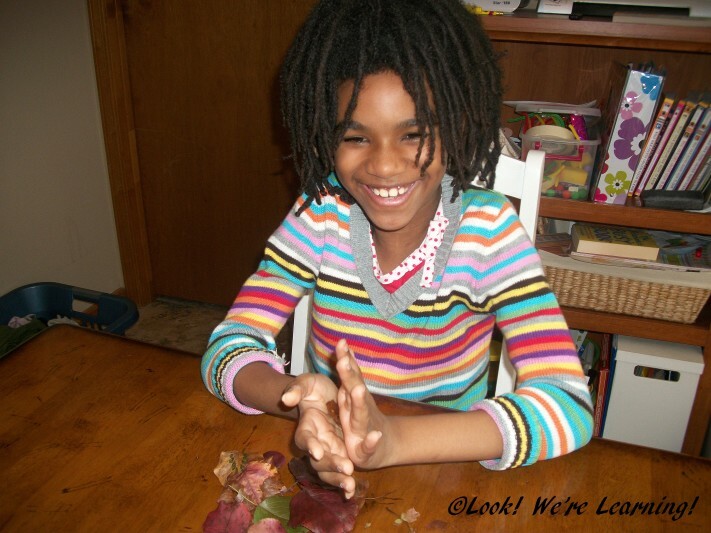 I had to use the very tips of my fingers to finish the rest of the project…lol. 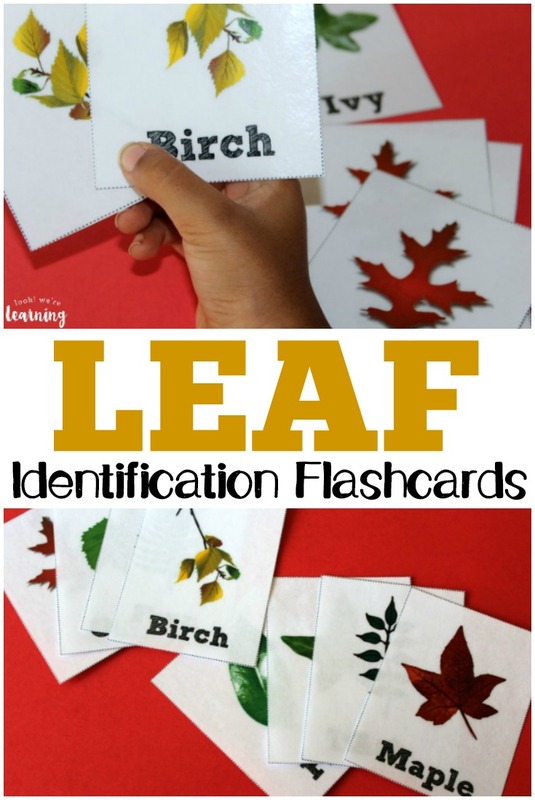 Want to make fall learning fun for your kids? 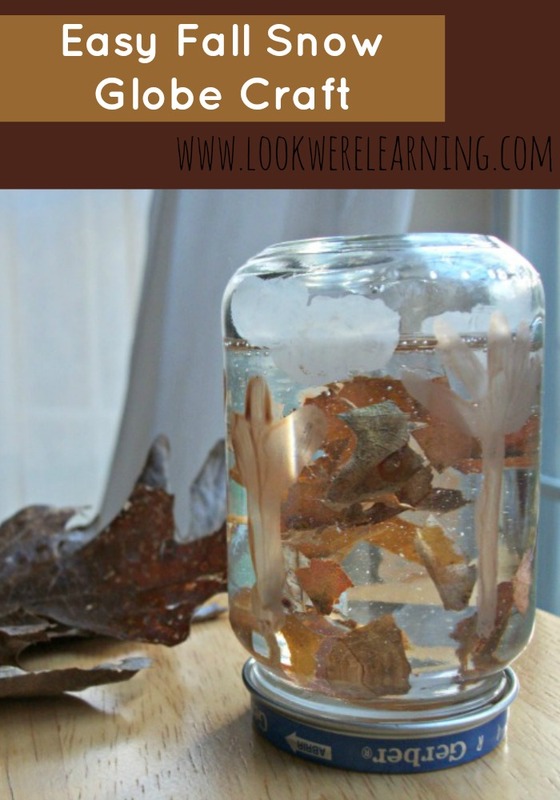 Try these ideas! 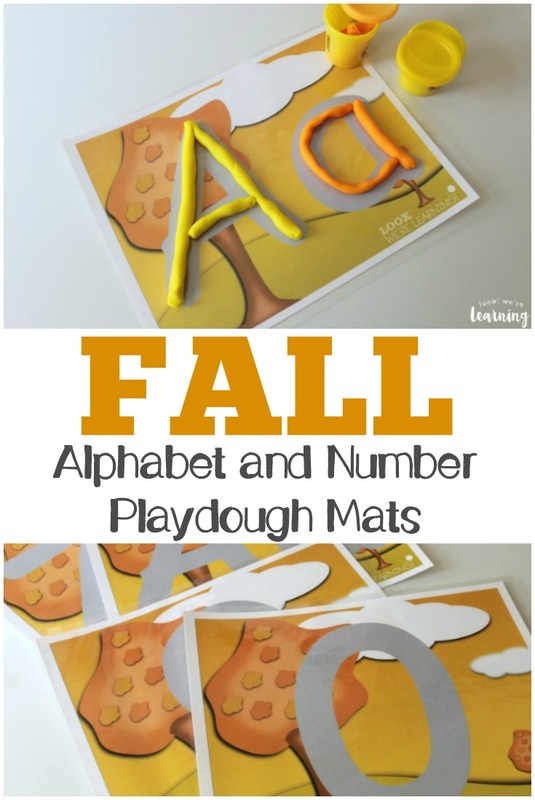 If you’d like to check out even more fall crafts and activities, be sure to follow my Fall Activities for Kids board on Pinterest! And if you want to get awesome educational ideas and resources in your inbox, use the widget below to sign up for our email newsletter!